Finally completed. 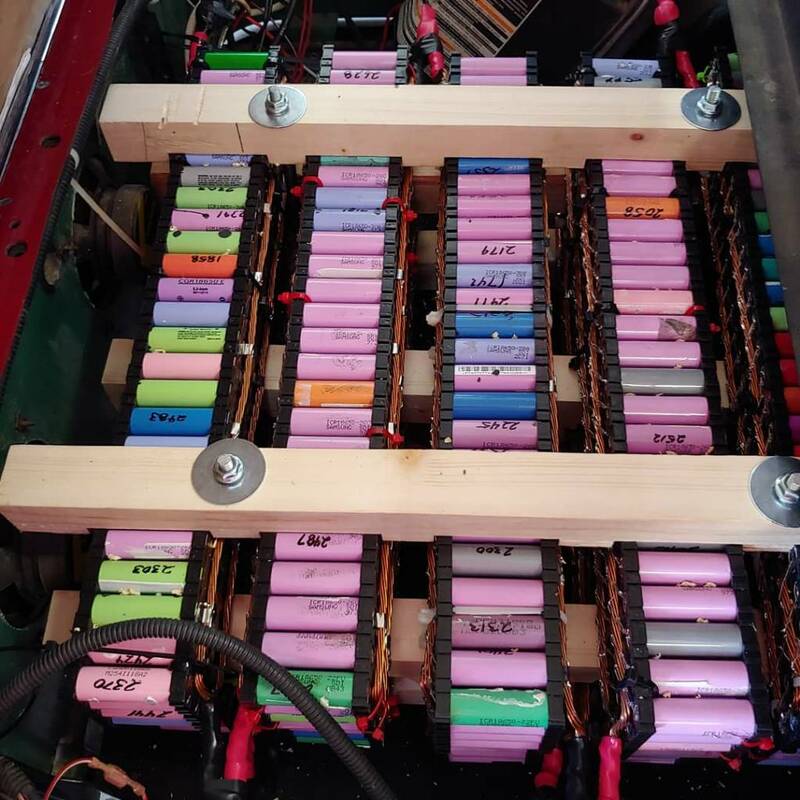 Set it up in 10s lithium, with 10 cells of 100 each "18650" lithium ion batteries. 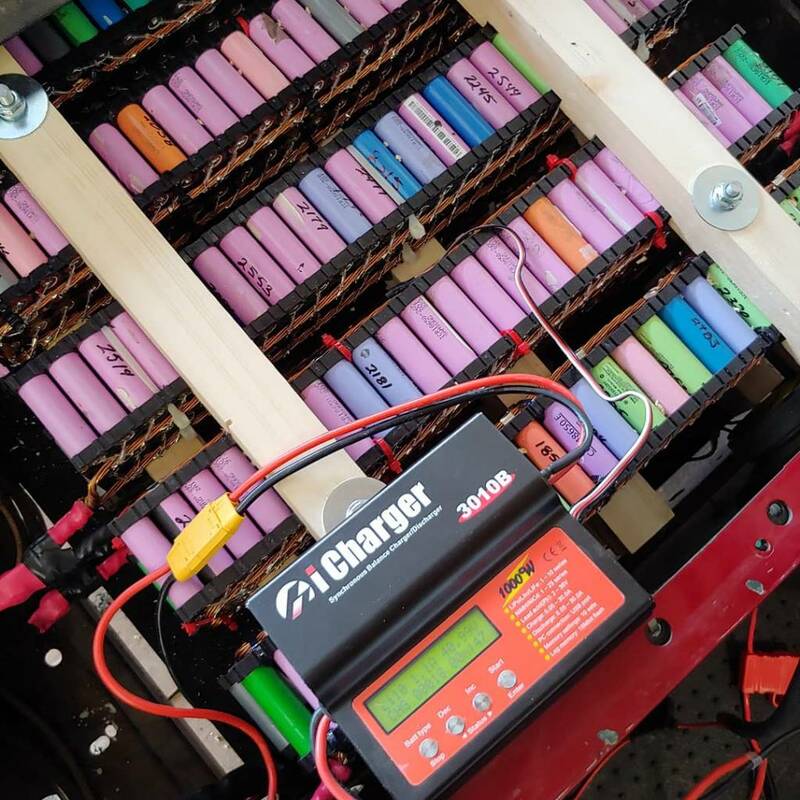 Full charged is 42 volts, but can run much longer than lead batteries, due to much more usable capacity, and the weight reduction. No more watering, and should be very low maintenance. I don't know anything about those but it looks like it should run about 6 months on a charge. Super cool! been thinking that same idea, but wasn't confident in buying that many used cells. Where you get that many cells? What's their overall capacity? Total number of cells used (1000?)? Any way to monitor their health? Also, does that little charger actually crank 1kw? The charger is capable of that, but this is only the controller essentially, it doesn't have its' own power supply. With my current power supply i can't go that high. I'm going to wire two server power supplies together and crank the power up. I salvaged the batteries from tool and laptop batteries, it was painstaking. Lots of testing to ensure their capacity was still good enough to use. Each cell is individually fused for safety. Also painstaking. Any idea what your specs are for the pack? Amp hour, charge time, run time ect.? Good job fusing every cell. Based on my "very rough estimation" averaging from the numbers I saw, I would guess it to be about a 220ah pack. Similar to a 7-battery T-105 setup by the numbers "at first glance". But it is significantly lighter than a lead pack, and as stated before, the safe usable range of this pack is much wider than a lead pack. Plus, if you compare the lead batteries at a 1C rate, they give about 56% of their "20 hour rate" touted on the label. Big win for sure! Well done! For a moment, a very brief moment, I had considered going this route when I first started researching switching to lithium. My patience is no where close to being adequate for this project. Out of curiosity, how much money do you think you have into the battery pack itself? My estimation is 230ah, so yes very close guess at 220. I would estimate i have probably $400 in the batteries themselves. 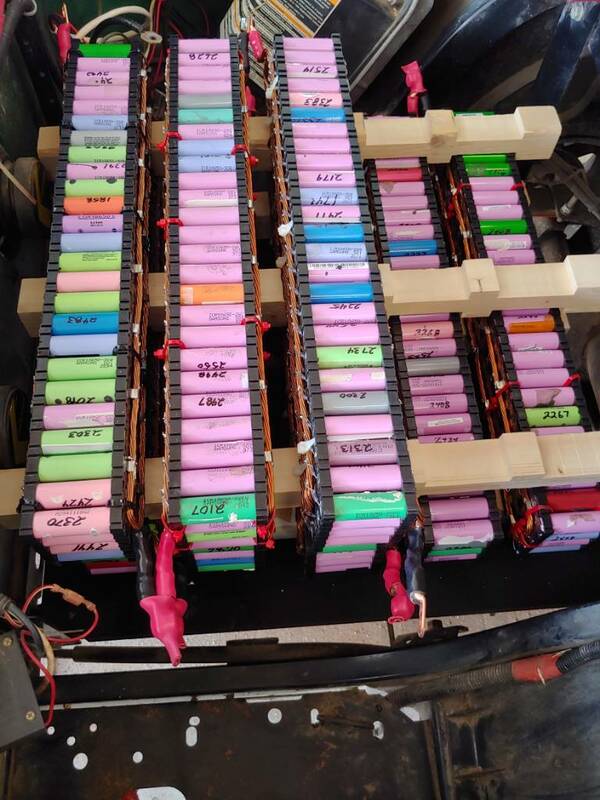 I lucked into a bunch of new old stock laptop batteries at an auction purplewave.com. they were from a school district, i got almost 500 brand new batteries for 60 bucks, and sold a laptop screen included for 30, so i guess i paid 30 bucks for half of them and 370 for the other half lol. So i will say if i had to do it again, i probably wouldn't do it again. Not that i don't love it or I'm not thrilled about it, it was a long project. I learned that tool batteries build better packs, generally, than laptops. Therefore, the batteries get used up more before a part fails, such as the bms board or a thermal sensor. If you have a connection to aviation or medical batteries using 18650s those were awesome for me. Laptop batteries were my favorite because they're easiest to find and easiest to extract the batteries from the pack. I invested 110 bucks in a spot welder, and probably 100 bucks in nickel strip, fuses, and flux and solder. The charger was probably 100, and I'll be about 50 or 100 to build a good power supply for it. However I'll now have a powerwise 2 i can sell, and i can sell the old lead acid batteries for cash. In addition the multitude of bad 18650s i have i have been selling to a contact, as well. Cgtech, the way I'll monitor their health is first with balance charging. A lead off each pack goes to the charger and will tell me if any cell is not performing. After that, it will revert to looking at fuses, or testing each battery in that cell. Another Tesla thread... Extreme DC!